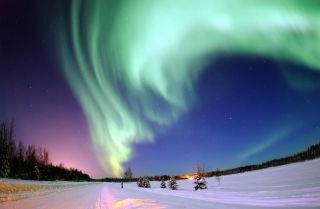 The aurora borealis, or northern lights, form during geomagnetic storms and are visible at high latitudes. These storms can also pose risks to the power grid. Communication systems are an integral part of daily life, but the sun can disrupt them by triggering powerful geomagnetic storms. To forecast these disturbances — which could affect GPS systems, air travel, national security and life-saving communications — scientists recently modeled the Earth data in 3D, an upgrade from one-dimensional predecessors. The sun releases radiation, some of which helps support life on Earth. This includes heat and visible light. But the sun also emits more-dangerous rays, and the blue planet's magnetosphere protects Earthlings from this radiation. Occasionally, however, intense solar events like flares send high levels of radiation toward Earth. When that radiation arrives and interacts with the magnetosphere, a geomagnetic storm can form. The planet feels its impact in many ways: Sometimes, the northern and southern lights manifest at Earth's poles, but the radiation can also cause communication systems to fail. This artist illustration depicts events on the sun that can change the conditions in near-Earth space. Space weather begins with an eruption such as a huge burst of light and radiation called a solar flare or a gigantic cloud of solar material called a coronal mass ejection. In a new U.S. Geological Survey (USGS) study, a scientific team used Earth data to calculate the voltages along power lines in the mid-Atlantic region of the U.S. They found that many of these measurements were significantly different from the results that the previous 1D model produced. "Our study suggests that 3D data of the Earth should be used whenever they are available," Greg Lucas, research physicist at the USGS and lead author of the study, said in arecent statement about the new findings, which were published Feb. 26 in the journal Space Weather. Using 3D modeling to gain a better understanding of the complex structures below the measurement sites, scientists can better determine which U.S. sites are most vulnerable to blackouts when powerful geomagnetic storms strike. In their new study, the USGS looked at the geomagnetic storm event of March 1989 in which the Canadian city of Quebec suffered a blackout. By modeling this scenario in 3D, the USGS scientists found 62 vulnerable sites that the 1D model did not catch. "This discrepancy between 1D- and 3D-based calculations of the 1989 storm demonstrates the importance of realistic data, rather than relying on previous 1D models, to determine the impact that a geomagnetic storm has on power grids," Lucas said in the statement. The U.S. Geological Survey is a scientific agency in the Department of the Interior. It researches the environment to provide information about Earth, its processes and any potential hazards they present. Follow Doris Elin Salazar on Twitter @salazar_elin. Follow us@Spacedotcom, Facebook and Google+. Original article on Space.com .